Look what I found in the market yesterday! These Thai eggplant were so pretty, I couldn't resist. It took some effort (to say the least) to figure out how to cook them. Sources suggested standard eggplant cooked Thai-style (not what I was hoping for), eating them raw (I did ... that, ahem, might be an acquired taste), deep frying (I just couldn't bring myself) or long lists of unfamiliar and likely hard-to-find ingredients. So ... armed with a few ideas and a big sense of adventure, I moved to the kitchen. Cooking, the eggplants remained a pretty green, the turmeric later added a yellow cast -- very pretty. And ... yes, quite tasty, a complete, if time-consuming, Veggie Venture success. How fun, sheer fun, is can be to 'play' with your food! Heat oil in a medium saucepan over MEDIUM HIGH until it shimmers. Add garlic and ginger, stir and let cook about 1 minute. 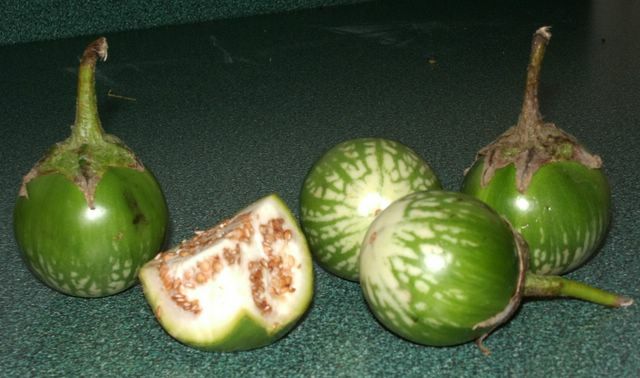 Meanwhile, remove stem ends from eggplant and cut in quarters. Add to pan, stir well. Add water, cover, reduce heat to MEDIUM and cook for about 10 minutes or until eggplant softens. (See TIPS.) While eggplant cooks, combine remaining ingredients. Add sauce and let simmer for about 5 minutes for flavors to blend. Taste and adjust seasoning. Chili paste has bite so start with less if your family has little apprecation for heat. Since I was unfamiliar with the cooking time, I kept taste testing for doneness. Tip: the eggplant was cooked long before it looked done.